Does My Business Need A Spill Containment Kit? George in the warehouse is showing off his latest fork lift truck driving skills to his buddies and during his latest 360 spin attempt clips one of your storage containers. In a matter of seconds, you have toxic chemicals spewing onto the warehouse floor. Your employees are scrambling trying to figure where the spill containment kit is, but are you carrying the right spill kit for the types of chemicals you are storing? Do you have a hazardous waste contingency plan in place and do your employees know what do when something like this happens? Chemical spills present a health and safety risk to your employees, your surrounding community. If not handled correctly, they can quickly become a major liability for your company in terms of regulatory fines and possible litigation. It is important that workplace spills are dealt with quickly and effectively in the event of an accident to mitigate potential damage. All businesses that work with hazardous or toxic chemicals (e.g. oils, solvents, bases and acids, etc.) are required to have a hazardous waste contingency plan, which would include a spill response plan. A spill response plan ensures the health and safety of your staff and surrounding community, and is necessary to ensure that your business is compliant with Environmental Protection Agency (EPA) and California Department of Toxic Substances Control (DTSC) regulations. 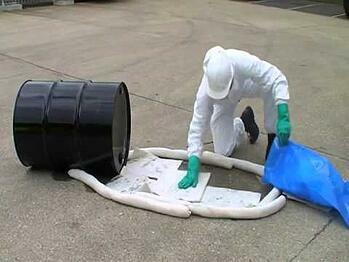 Spill containment kits are the first line of defense in the event of a workplace accident involving toxic chemicals. If your business works with any of the toxic chemicals mentioned above, the short answer is YES. There are many different options available and many companies are confused as to which spill kit will best suit their needs. Here is a description of the basic contents that make up most commercially available products. Which Spill Containment Kit is Right for Your Business? As previously mentioned hazardous waste generators should have a hazardous waste contingency plan and spill response plan in place. Before selecting the appropriate spill response products for your workplace, you should consult the MSDS (Material Safety Data Sheets) for correct spill response practices for each chemical in your workplace. Once you have an idea about the types of risk that you face, and the response necessary in the event of a spill, you can begin to build your spill containment kits. It is crucial that business owners do not take short cuts with this process. Compliance with the hazardous waste laws will avoid the potential pitfalls of a spill response going badly and avoid heavy fines and negative publicity. It’s not only imperative you have the right spill kit available for the right application you should also have the correct PPE for handling a spill response. An experienced and properly licensed hazardous waste company can be of value in this process. A free hazardous waste walk-through is an evaluation of your hazardous waste procedures, including your hazardous waste contingency plan and your spill response plan. Experienced technicians who are current on both the federal and state laws can pinpoint areas of concern and provide cost effective and simple solutions to your hazardous waste needs. Specifically, they can help guide you in the process of assembling appropriate spill containment kits and ensure that your employees are appropriately trained.